With weapons drawn, they stop an SUV after a report that one of the occupants had flashed a handgun. 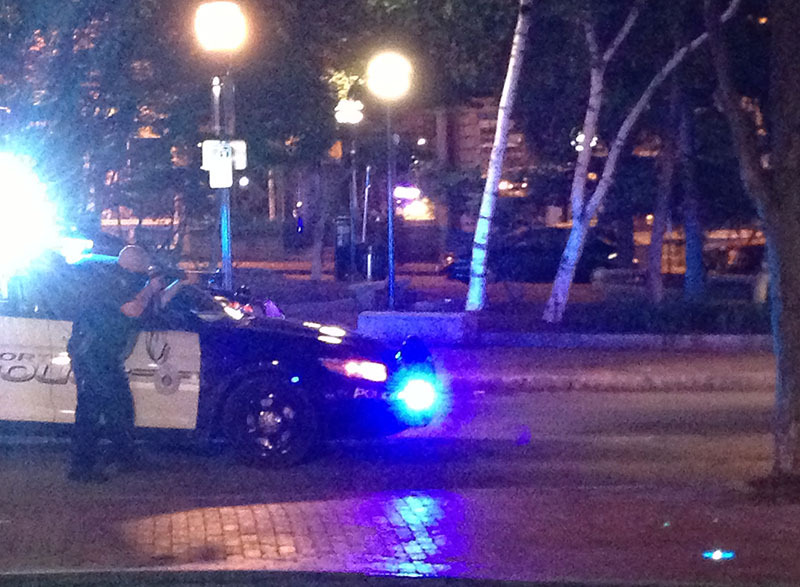 Five Portland police officers stopped a white sport utility vehicle in the Old Port Sunday night after police received a report that one of the occupants flashed a handgun at people who were in Tommy’s Park. Lt. Gary Hutcheson said the officers executed a “high-risk traffic stop” on Exchange Street in which they drew their weapons as they approached the Ford Escape. While removing the occupants from the vehicle, a woman identified as 25-year-old Alicia Kane, for whom no address was available, repeatedly interfered with the officers by approaching the SUV and refusing officers’ commands to stay back, Hutcheson said. Officers arrested Kane and charged her with obstructing government administration. Hutcheson said the report that one of the occupants was armed with a gun turned out to be false. Officers found a large, shiny knife in the vehicle. Kane, who was handcuffed and seated on a curb, appeared to be having some type of medical problem. She was placed on a blanket and led to an ambulance. Hutcheson said Kane, who is the girlfriend of one of the occupants, apparently suffered a panic attack. She was taken to Maine Medical Center for evaluation before being transported to the Cumberland County Jail. Officers eventually removed the handcuffs from a man who had been inside the SUV. He was not arrested. Hutcheson said the incident, which was reported at 9:35 p.m., remains under investigation. Several bystanders witnessed the incident, which took place outside the dining room of Sonny’s Restaurant & Bar, 83 Exchange St.